Billy and Christy with Nali and Chami. Even the delay caused by Billy’s illness didn’t dampen Christy’s enthusiasm. “We have learnt so much about ourselves, our horses and the people of Africa. We have discovered that the most important things to pack on a journey like this are: Patience, Perseverance and Politeness! They are far more useful than a dictionary,” Christy wrote. The worst accident in the history of modern equestrian travel has taken the life of a female Long Rider, left her companion seriously wounded and gravely injured their horses. English Long Rider Christine Henchie, 29, was killed instantly on Monday, January 28, by an out-of-control bus in Tanzania. Her fiancé, South African Long Rider Billy Brenchley, 43, escaped death by inches but suffered a broken leg. A crowd of enthusiastic locals who had turned out to cheer the Long Riders past their village were also killed and injured by the reckless driver. Charles Mahugija, 60, and Willy Masanja, 55, were slain and 25 bystanders, including many small children, were mown down by the speeding vehicle. The accident, which occurred in the isolated village of Isela, marked the latest episode in what has become one of the most remarkable equestrian journeys in history. The couple set off in 2007, determined to complete the first ride from the most northern point of Africa, Cap Blanc in Tunisia, to the most southern point of Africa, Cape Agulhas in South Africa. Ten countries and an untold number of hardships awaited them. The couple’s excitement was quickly replaced by a sense of growing determination, as they were called upon to overcome an unprecedented number of modern obstacles. They were detained in the Sahara desert for 75 days while the Libyan Government debated whether to allow them to enter. Egypt, with its sandstorms, tick bite fever and heat waves proved difficult. But that was the easy bit. After riding across Tunisia, Libya, Egypt and northern Sudan, Billy and Christy were halted by the impassable swamp known as the Sudd. If the equestrian explorers wanted to progress they would have to load their two horses onto one of the few remaining cargo barges and float south to the distant city of Juba. Their thousand mile nautical journey is unique among modern equestrian travellers. Petty officials stopped the vessel 46 times to demand bribes from the captain and passengers. Christy can be seen sitting atop the container, in front of the tent, while Chami and Nali wait for the 27-day voyage to end. Having arrived early, Billy and Christy were lucky to find the immense flat-topped barges still empty. Because deck space would be severely limited, there was no room to construct a pen. After a load of sand was dumped on the deck for footing, the horses were tied side by side to an immense steel fitting atop the deck. The Long Riders, meanwhile, pitched their small tent on a nearby steel container. Christy and Billy ate fresh fish, while the horses dined on papyrus leaves harvested from the Nile river bank. They were no sooner back on shore and in the saddle when political turmoil threatened their lives. A bitter civil war had just been concluded which left the victorious rebels in control of the newly formed country of Southern Sudan. Suspicious rebels accused them of being spies and gun runners. They were threatened with prison and with having their horses shot. Once again, cold courage saw them through. As they made their way through Southern Sudan, they passed areas where major battles had been fought. The landscape was littered with unexploded mines. Immediately, after crossing into Uganda the differences between the two countries became apparent. Aggressive, suspicious faces were replaced by friendly and welcoming people. It was in Uganda that Christy and Billy made an astonishing discovery. Horses had disappeared from the country during the reign of Idi Amin. The unexpected sight of two Long Riders mounted on mysterious animals caused pandemonium in the countryside. “We became the Pied Pipers of Uganda by unintentionally leading a number of kids 25 kilometres along the road,” Christy informed the Long Riders’ Guild. “The noise level was tremendous. Cantering didn’t faze them – they merely ran after us. When we finally stopped for the evening, children of all ages surrounded us in excitement. It was also while riding through Uganda that Christy and Billy were exposed to every Long Rider’s nightmare – murderous drivers and dangerous roads. Horses and mechanized traffic originally shared the road. In those early days it was safer to ride near cars for several reasons. There was a great deal more horse traffic. There were fewer cars and they seldom exceeded speeds that would today be considered faster than a crawl. More importantly, the drivers knew and respected the needs of horses. Today it is vastly different. As they made their way south towards the capital, Christy sent the Guild this ominous prediction. Having ridden across the Sahara, sailed down the Nile, survived a war zone, eluded hordes of excited children and reached the halfway mark in their journey, Christy and Billy believed the worst was behind them. Billy riding through traffic in Kampala. Traffic, in one form or another, tests every Long Rider. Upon reaching Kampala, Billy and Christy were forced to thread their way though a hostile motorized environment. In fact, their greatest challenge came crashing out of nowhere. While riding in Southern Sudan Billy had suffered, and survived, malaria and typhoid. Feeling weak, he sought medical advice in Kampala. After running blood tests, the doctor announced that he could not believe Billy had lived long enough to walk through the door, much less ride across Africa. He was diagnosed with Acute Myeloid Leukaemia and immediately flown to South Africa for emergency treatment. It took sixteen months for Billy to recover. After undergoing chemotherapy, he and Christy returned to Uganda in late 2012 to resume their interrupted journey. After spending several weeks gradually getting themselves and the horses back in shape, the team set off again in mid-January. Their next destination, Tanzania, was close by. Christy and Billy’s dreams were brutally shattered a few days after entering Tanzania. Speaking by phone from a hospital in Nairobi, Kenya, Billy explained how the tragedy unfolded. As in Uganda, the appearance of mounted travellers sent shock waves racing across the Tanzanian countryside. Crowds numbering up to 200 had been following along for several days. The morning of January 28 was bright and sunny. By 8.30am, the Long Riders had travelled less than three kilometres but a crowd of 70 excited Tanzanians, including many small children, were already eagerly following alongside. Christy was in front, walking alongside Chami, while Billy walked close behind with Nali. As they approached the small village of Isela, happy villagers came out to cheer them past or walk alongside. With the people in place, tragedy came tearing down the road. A steep hill lay ahead. A slow-moving truck was making its way up from behind. Meanwhile, another truck was coming down the hill towards the village. Christy and Billy were well off the road and could see for miles. It was thanks to this visibility that Billy saw a large bus full of passengers speeding down the hill. Frustrated at being delayed by the slow truck, the bus driver veered out to overtake, only to find the way blocked by the oncoming vehicle. Instead of waiting patiently to pass, the bus driver whipped his vehicle to the other side of the road and tried to pass the truck on the inside. Billy had just enough time to shout to Christy to move further off the road, when the bus came screaming round the truck. Long Riders, horses and children were in his blind spot. The bus ran straight into the defenceless crowd. Christy with the horses on the Nile. Seeing the famous river for the first time and being offered a camel to sell to enhance their bank balance were some of the Egyptian delights Christy noted on their blog. “There was no squeal of brakes. He came right at us,” Billy recalled. The speeding bus hit Christy without warning but her horse, Chami, jumped aside. Next it hit Billy. The impact threw him through the air and into a ditch. His horse, Nali, was also struck. Then it smashed into the crowd. The youngest victim was three years old. The driver then lost control and crashed into the oncoming truck. Billy had never lost consciousness but he discovered he could neither walk nor stand. He crawled out of the ditch and dragged himself towards Christy’s body. Shinyanga regional Police Commander, Evarist Mangalla, confirmed the accident, attributing it to reckless driving, but declined to give details. There is no word regarding the fate of the bus driver. Nor is it known if the authorities will file charges for vehicular homicide. Christy was declared dead at the scene, after which Billy was transported to the nearest hospital. After a brief examination, he was diagnosed with a broken right femur and transferred to the larger Bugando Hospital in Mwanza. Though the wounded equestrian explorer had been assured that the Tanzanian Government would cover all the costs of his transport and care, he was shocked to discover that the hospital was reluctant to provide him with even the most basic amenities. Nor were Billy’s troubles over. When friends contacted his European-based insurance company the next day, officials refused to fly the wounded traveller home to South Africa for medical treatment, insisting instead on sending him to Nairobi, Kenya. Though his broken leg has been set, friends in Kenya have had to organize a blood drive to help Billy combat the threat of a recurrence of leukaemia. Meanwhile, although the Tanzanian authorities quickly provided Christy’s family with a death certificate, the same European insurance company has delayed authorizing the funds needed to repatriate the deceased Long Rider’s body to her home in South Africa. Nor has Billy, still stranded in Nairobi, been provided with a “fit to fly” certificate which will allow him to return to South Africa to attend Christy’s funeral. What has been established is that both horses, though injured, survived the unprecedented accident. Local citizens have rallied to protect, feed and care for Chami and Nali. Billy was told that Christy’s horse, Chami, was badly scraped by the passing bus but appeared to be all right. Things do not look as optimistic for Billy’s horse, Nali. After having crossed four deserts in temperatures exceeding 50 degrees Celsius (122 degrees Fahrenheit), survived sandstorms lasting for days, voyaged along the Nile and endured crowds of curious children, the legendary road horse may have suffered a broken right rear leg. An examination was planned as this story was being written. Billy in the Shinyanga hospital. Despite assurances from the Tanzanian government, the Mwanza hospital refused to release Billy unless he paid $100 for his room. The police had taken his money and gear into safe-keeping, so a friend had to pay the fee before Billy could be transported to the airport and flown to Kenya to have his broken leg set. For the moment, Billy’s health is too precarious to be concerned with those questions. What is known is that the most experienced female Long Rider of the 21st century, a woman who overcame deadly deserts and rode through a war zone, a lady whose love and loyalty never faltered, has been taken from us far too early. Shortly before setting off to resume her journey in January, Christy took the opportunity to look back upon the epic ride she and Billy had undertaken. Shortly after these tragic events became known, British Long Riders Matt Travers and Jamie Maddison announced that their upcoming 15,000 kilometre journey across Central Asia will be made in memory of Christy Henchie. Because of Billy’s medical problems, and the Henchie family’s immediate concerns, people wishing to express their sympathy and support should send emails to the Long Riders’ Guild at longriders@spamarrest.com. All messages will be safeguarded and passed on. 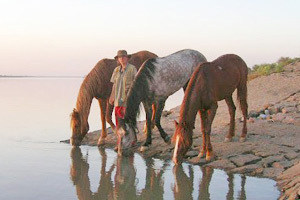 To learn more about Billy and Christy’s epic equestrian journey, visit their blog, www.africanhoofprints.blogspot.com. All images courtesy Billy Brenchley. I drove through Shinyanga region yesterday and saw, at some point, two horses next to a tent. I believe these are the surviving horse. I was aware from local news reports of the accident. Driving conditions on Tanzania’s roads are dangerous at any place, at any time. Anyone – driver, horse rider, pedestrian – who is near these roads at any time and does constantly remind himself/herself of this maxim is placing himself/herself in grevious danger. I would have advised riding off the main roads and on secondary roads or footpaths for most of the journey through Tanzania. Please keep us updated on how the horses are doing, especially the one whose hind leg was thought to be broken. Thank you. We have followed and read about your story on a number of occasions and wanted to write to tell you that my husband and I find you and Christy inspirational. When any of us step outside of our comfort zone and dare to do something other than go to an office, come home and sit on a sofa there is a increased risk of danger but you both dared to take this risk. Your journey and courage will not be forgotten and your story, whilst very sad is also one of hope, determination and bravery. I wish you a speedy recovery and I hope you can find the strength to continue in whatever you decide to do with the rest of your life. My word. Billy used to be my horse’s farrier in Cape Town, South Africa before he left on this epic journey with Christy. My dad and I were thinking the other day “we wonder what happened to Billy and Christy?”, so today I Googled “Billy Brenchley” and found this article. I’m shocked and devastated! RIP Christy, and Billy if you remember me and my horse I wish you a full physical recovery, we are sending lots of love. The horses stayed at my house whilst Billy was in hospital and Christy was travelling up and down. Believe it or not, I do remember Billy saying that he had jobs as a farrier for multiple people around South Africa. Just thought you might want to know that…..